I like making gardening easy, so dwarf conifers fit me like a glove. Imagine! Once the plant is established (so, after the first year), there is no need for pruning, fertilizing, winter protection or even, in most cases, watering … at least, unless there is a really bad drought. 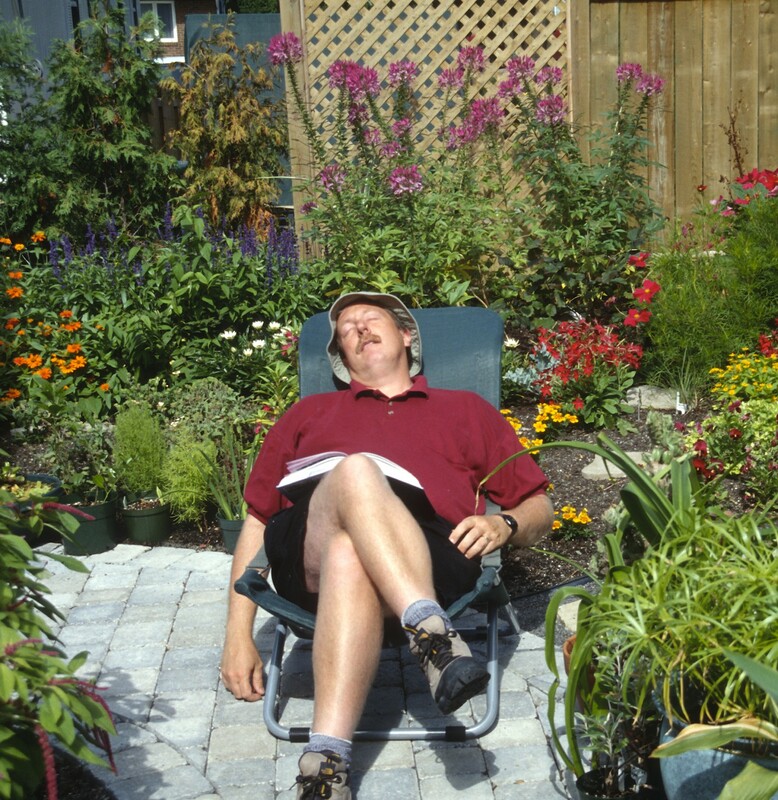 Really, they don’t make plants any easier: they’re just the thing for the laidback gardener! True enough, gardeners who are focused on blooms are going to find them a bit dull, because conifers simply don’t have striking flowers. In fact, in most cases, the flowers are so discreet that they literally go unnoticed! But flowers aren’t everything, and yearlong foliage is hard to beat. After all, how many flowering plants can offer non-stop beauty 12 months a year? And dwarf conifers come in such a wide-enough range of colors, textures and shapes (pyramidal, oval, columnar, flared, rounded, mounded, etc.) that any decent garden designer could create striking gardens using them alone! What Is a Dwarf Conifer? Very few conifers are natural dwarfs. Most dwarf conifers come about as mutations, when a normal branch on a normal tree suddenly produces a section with very compact growth, often with shorter needles. This type of mutation often forms a clump of branches, a phenomenon known as a witch’s broom. If you take a cutting or graft a branch from a witch’s broom, usually the new plant keeps its compact growth habit. Bingo! You now have a dwarf conifer. However, the term “dwarf conifer,” although the accepted term in horticulture, was really not well chosen. I would have rather called these plants “slow-growing conifers,” because any conifer, even a so-called dwarf one, will continue to grow all its life. So, eventually, even the smallest of the dwarf evergreens will become humungous over time. I’ve seen a “dwarf” conifer that I was told was 65 feet (20 m) tall (no, I didn’t measure it myself!)! Admittedly, it was believed to be well over one hundred years old, but still, that gives you an idea that dwarf conifers do grow and perhaps faster than you think. The American Conifer Society developed four size categories for conifers, according to their growth rate, and this very useful information is being shared by more and more nurseries. Miniature Conifer: grows less than 1 inch (2.5 cm) per year, so a 10-year old specimen could still be under 1 foot (30 cm) in height and spread. Dwarf Conifer: grows 1 to 6 inches (2.5 to 15 cm) per year. That means some might be 5 feet tall or wide after 10 years … possibly less dwarf than you had hoped. Intermediate Conifer: grows 6 to 12 inches (15 to 30 cm) per year. Large Conifer: grows by more than 12 inches (30 cm) per year. For small gardens and intimate corners, therefore, prefer miniature or dwarf conifers. Did you know that when you buy a dwarf conifer, the dimensions listed don’t refer to its maximum size, but rather its dimensions when it reaches 10 years old? It will not just reach that size and stop growing, but will keep on at the same pace. This convention, adopted by many conifer growers, is not well-known to amateur gardeners, who assume that measurements they see on the label are maximums and so are surprised—if not stunned!—to see their “dwarf conifer” engulf their entire flower bed over time. For example, a dwarf mugo pine (Pinus mugo mughus) whose dimensions are listed as something like 3 feet (1 m) in height by 5 feet (1.5 m) in diameter will reach that at about 10 years of age and will certainly not be very dwarf in 20 years when it will measure 6 feet (2 m) in height and 10 feet (3 m) in diameter! And imagine its size in 40 years! This miniature conifer garden looks fine now, but it’s very overcrowded. Already some varieties are encroaching on others and things will only get worse over time. You have to give dwarf conifers considerable space if you want their effect to last. Source: www.pinterest.ca. When you’re planting a dwarf or miniature conifer, mentally double the dimensions on the label or in the catalog, then place the plant according to those calculations. In other words, set each tiny plant at quite a distance from its neighbor! Then cover the soil with thick mulch to prevent weeds as it slowly grows and fills in. That way you’ll have about 20 years of beauty with little to no maintenance. Unless you have a lot of room, it isn’t easy to recuperate an overgrown conifer and, in fact, in most cases, it’s probably impossible: most of them simply do not respond well to rejuvenation pruning. So, after 20 years of lying back and watching yours grow and thrive, get out of your hammock and put a bit elbow grease into removing it. Then replace it with another dwarf conifer. That will give you another 20 years of peace! I can only give you very vague information about growing dwarf conifers. That’s because there are so many different varieties, each with their own preferences. For example, when it comes to climate, some thrive in the tropics, others in the Arctic and some do just fine under desert conditions while others prefer rainforests. That gives you some idea about just how widely their needs can differ! Even some, a few generalities do apply. For example, most prefer full sun and will tolerate partial shade. There are also a few shade-tolerant conifers, such as yew and hemlock. Most conifers need well-drained soil … but the bald cypress (Taxodium distichum) is an exception and will grow with its roots in water. And yes, there are dwarf varieties of this species. Source: Kej605, Wikimedia Commons. Most conifers prefer well-drained soils, although there are a few that will grow in soggy ones! Most do fine in acid soil, but none require acid soil. There are also conifers tolerant of alkaline soils (some junipers and yews, for example), but again, none require such soil. Watering needs of most conifers are fairly modest … once they’re established, at least. The first year after planting, it would be wise to keep their soil on the moist side until their roots develop. Thereafter, you’d only need to consider watering them in periods of extreme drought. If the fall is dry, though, water them until the ground freezes, otherwise their needles may dry out and “burn” during the winter. Few conifers tolerate salt spray (white spruce [Picea glauca] and blue spruce [Picea pungens] are among the few exceptions), so it’s not wise to plant conifers too close to bodies of salt water or near roads treated with de-icing products in winter. Nor should you plant conifers in the path of snowblowers that shoot out snow and ice crystals that tear off needles, bark and buds. Of course, always choose conifers adapted to your local hardiness zone. The hardiness zone of the variety is usually listed on the label. Basically, choose plants adapted to your zone or colder ones (ones with lower numbers). If you live in zone 6, for example, choose conifers adapted to zones 1, 2, 3, 4, 5 or 6, but not 7. In zone 5, go for zones 1, 2, 3, 4 and 5, but not 6. Etc. Normally, if you have chosen the right dwarf conifer for your location, no pruning will be needed. On the other hand, sometimes dwarf conifers produce a reversion, a stem that returns to the normal growth pattern of the species, i.e. a much longer distance between nodes. If you leave the reverted stem on the plant, it will grow faster than the rest and take over, destroying your plant’s symmetry, so just prune it off. But shouldn’t you be fertilizing your dwarf conifer? Well, first remember that you want it to stay small. Fertilizer can stimulate longer branches and you don’t want that. Plus, even normal-sized conifers usually get along fine without fertilizer. (Those specialized conifer fertilizers you find on the market are mostly there to give anxious gardeners the impression they’re doing something useful for their plants.) Unless the soil you’re growing your conifer in is extremely poor, it will take care of its own mineral needs. If you chose a conifer adapted to your growing conditions, no water protection should be needed. And indeed, one of the reasons we plant dwarf conifers is because they are attractive year-round, hardly the case if you wrap them for the winter! However, it may be useful to protect yours from the drying effects of the wind for the first winter. No need to wrap them up like a mummy, though. Just install a temporary screen (a piece of geotextile or jute stretched between two stakes, for example) between the plant and prevailing wind at the end of autumn. In following years, no protection will be necessary. Dwarf conifers—and especially miniature ones—also make excellent container garden subjects for decks, balconies or rooftop gardens. But be sure to choose an extra-hardy cultivar, as cold penetrates more deeply into the soil of potted plants than it would in the ground. So, prefer a variety hardy to at least one zone colder than your zone. Gardeners in Zone 6, for example, should consider conifers for zones 1, 2, 3, 4 or 5 for container culture rather than zone 6; those of zone 5, conifers for zones 1, 2, 3 and 4, but not 5, etc. There you go: colorful dwarf conifers may be just what you need to give your landscape a bit of pizzazz in all seasons while you just relax and let them grow!